When I was in junior high school, I wrote a secession fantasy about my home city seceding from California to be its own nation. That’s sort of what Carol Joynt’s screed about a free Georgetown reads like to me: adolescent fantasy at its finest. Specifically Joynt says, “Reason one is that DC’s not going to get home rule. I just don’t see it happening.” But fails to get around the fact that the District’s borders are firmly established in law, and would likely have to be rescinded by a vote of the whole of the city, as well as the United States Congress. It’s just as unlikely that a “free” (read: free of all those black people) Georgetown would have any better luck passing laws without the oversight of Congress, either, as long as it stood on the same land. The other line that drew my ire was, “I’m sure in time, the DC government would be coming to Georgetown for loans. But now it would be our money and not theirs.” As if to say that the goal of a free Georgetown would be the creation of a cash-flow positive government designed to be a bank, and not a community. Worse than that, it’s fulfilling stereotypes that the rest of the community often sees of Georgetown. Carol, if what you want is a better place to live, then work with the community to make it better for everyone, not just your tiny sliver of DC. Don’t just take your ball and go home crying that they’re not listening. We have to work in our communities to make life better for all, not just the wealthy elites sitting on brutally expensive property that was built on the backs of the poor. If you want to move back in time, though, I guess you can start a little secessionist movement. If it makes you feel better. It shouldn’t make you feel better, but maybe in your tiny pocket of DC, it will. I must have missed the part where Georgetown had non-chain shops and interesting restaurants to maintain. Nor am I sure how Georgetown would get home rule unless it allowed itself to be absorbed into Virginia. Funny stuff. If Georgetown were to go independent, where is its commercial tax base? It has no regional draw of a downtown. The cited example, Santa Monica, does have a downtown and a jobs base. It’s also a much bigger city (16 square miles, 87,000 people) than the entirety of Ward 2 – yet alone just little old Georgetown. Not to mention the fact that Santa Monica was incorporated in 1886. @Tiffany perhaps when Mrs. Joynt refers to “sole proprietor-independent businesses” she’s specifically harking back to her days running the now closed Nathan’s. Perhaps she thinks Barnes & Noble, Banana Republic, and Benihana are non-chain because she just never leaves Georgetown. I understand the kernel of discontent that sprouted in Ms. Joynt: DC is a notoriously difficult place to get stuff done. Be that as it may, the answer isn’t to splinter apart, but rather to work to bring all parts of DC up. The angry part of me says “If Joynt can’t make her own restaurant work, what makes her think she’d be any better at balancing Georgetown’s budget,” but that’s just the angry part of me. The realist says she’s probably seen a lot of difficult situations in the Georgetown business community that she thinks smaller government could fix. I’m not so sure this is a bad idea. But it needs to be bigger. How about all of DC seceding from the United States. We don’t get to vote, so we’re barely a part of it now. We could lease back all of the federal buildings to the US government for enough money to cover the US government’s usual contributions. We could charge MD and VA drivers for entering the district for work. We could have a very pro-business/banking/law-firm tax environment (think monaco, HK, luxemburg). When the US government throws an event — inaugurations, etc. — we could charge them what it actually costs, plus a party-planning fee — think profit. Our lives wouldn’t noticeably change w/r/t the rest of the country, but we’d have true home rule. Forget Georgetown — that’ll never happen. Instead, let’s focus on getting Northern Virginia free from Richmond. NoVA Secession NOW! I think this is a fabulous idea. You can speak nobly about how great it is to work to improve the entire city together but that notion is what should be considered fantasy. What better way to get actual representative government and reduce political conflicts than by seceding into smaller jurisdictions? @Tiffany I totally agree with you. Miserable failed attempt at blog sarcasm. @Not a bad idea In my opinion, any state, district or town succeeding from the United States is a bad idea. Arguing otherwise would be advocating for another Civil War. And yes, our lives would change dramatically with regards to the rest of the country if we succeeded in succession, because we wouldn’t be American citizens. 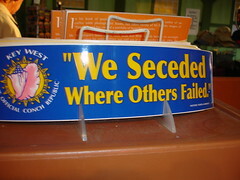 The United States itself was a product of secession from Great Britain. There’s nothing wrong or immoral with excusing yourself from an unfavorable political situation if the alternate means of change have proved ineffective. Comparing Georgetown’s DC government grievances to those of the American colonies is ridiculous. The two don’t even come close. I never equated the two grievances. If you’re ok with one but not the other then the argument is whether the given situation is bad enough, not that secession is wrong in principle. Above you agreed with Notabadidea that Georgetown seceding from the US was “a fabulous idea.” Therefore, I assume you find the current situation so unfavorable that you would support the disbandment of our union and the destruction of the U.S. Construction. This is a radical and revolutionary stance. I’d agree that it’s a radical and revolutionary stance. I tend to have a low threshold requirement for seceding. I don’t put any weight on arbitrary national borders or jurisdictions, therefore I see nothing wrong when either of those are dissolved. The state is not a relic of the past, Nacim. You cannot wish it away because you find it inconvenient. I should’ve added “or modified” at the end of my last comment. Of course the biggest irony here is that you have an Arlingtonian, who pays no income or real estate taxes to DC due to Alexandria County’s retrocession to Virginia, taking a holier than thou approach to somebody suggesting the same approach for Georgetown. Listen, I think Carol’s post is drivel, but living in Arlington, where you avoid the problems and responsibilities of DC’s urban poverty, is just as much a cop out as Georgetown seceding. Seriously “homes built on the backs of the poor”? How about the fact that your entire county’s success is built on the back of DC’s poor? You think you’d have that same school system if it never split from DCPS? You think your police force would be so great if its resources were spread around Ward 8? You got a nice glass house there Tom. Be careful with those stones. An Arlingtonian who’s sold his condo to move into the District, Mr. Anonymous, and who works to this day in the District, paying countless dollars in sales taxes. I work with clients in Anacostia and in Georgetown alike, working with schools in poverty conditions, so yeah, I recognize Arlington’s not DC. My residency isn’t an issue here, Mrs. Joynt’s despicable quasi-racism is. She’s welcome to move to Arlington if she feels so ignored. Quasi-racism? Jeebus. Mrs. Joynt wrote a silly and naive piece about the potential benefits of local rule, as if Georgetown is the modern incarnation of Rousseau’s Geneva or Pericles’ Athens. I mean, the blog post isn’t fit for a middle-school civics class. BUT, nowhere in the post does she say anything remotely racist, semi-racist, pseudo-racist, or “quasi-racist,” whatever that means. The most despicable thing I see on this thread are baseless accusations and low-IQ race-baiting and baseless accusations.